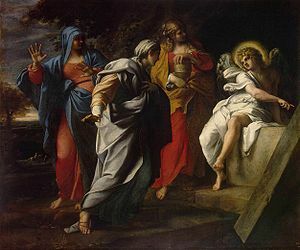 Annibale Carracci, The Holy Women at the Tomb of Christ, circa 1597-98. Resurrection Sunday (also known as Easter) is the Christian holiday marking the resurrection of Jesus Christ. It would be counted as two days after His crucifixion on Good Friday by modern day counting, but three days by Biblical inclusive date counting whereby parts of days are counted as days. It has been considered the most important festival of the liturgical year. Pascha is the celebration of Easter in the Eastern Orthodox church. 3 Origin of the name "Easter"
4 The name "Resurrection Sunday"
In 325, the Council of Nicaea declared that Easter would be celebrated on the first Sunday after the full moon of the vernal equinox. Resurrection Sunday doesn't fall on a fixed date in the calendar. Instead, it is based on a lunar calendar like that used by the Jews. At the Nicaean Council in 325 AD it was decided that Resurrection Sunday would be celebrated on the Sunday after the first full moon on or after the day of the vernal equinox. The date of the full moon was to be determined by using the Metonic Cycle. Eastern Orthodox Churches still use the Julian calendar when determining the date of Resurrection Sunday and thus have a different date for the celebration. The Miraculous Draught of Fishes by Konrad Witz. Resurrection Sunday marks the end of the 46 days of Lent, a period of fasting and penitence in preparation for Resurrection Sunday, which begins on Ash Wednesday and ends on Resurrection Sunday. However, Lent really only comprises 40 days since the 6 Sundays during this period are excluded from the Lenten fast, and are days that are set apart to commemorate Resurrection Sunday and Jesus Christ, who rose from the dead, defeated the grave and guaranteed eternal life to those who believe. The days before Resurrection Sunday also are special in the Christian tradition: the Sunday before is Palm Sunday, and the last three days before Resurrection Sunday are Holy Thursday, Good Friday and Silent Saturday. These days commemorate Jesus' entry into Jerusalem, the Last Supper and the Crucifixion. Origin of the name "Easter"
The term "Easter" is likely derived from Eastre or Isthar, who was the pagan goddess of fertility for whom the Festival of Ishtar was celebrated each spring. Others suggest that the word comes from the Anglo-Saxon word for "passover". In biblical times the Jewish Passover, which commemorates the sparing of the Hebrew firstborns, was celebrated at roughly the same time as the vernal equinox or this “Easter” festival. The theory of pagan origin surmises that while the Gospel was being spread to the pagans, the celebration of Eastre and the celebration of the resurrection became combined and the Christians adopted the name that the pagans had used for their festival. This name is used in Mexico: "Domingo de Resurrección," which translates as Resurrection Sunday. In the United States, most Christian churches continue to prefer the word Easter, although Resurrection Sunday has gained favor in some Protestant churches in recent years, most often as a response to the possibly pagan origins of the name "Easter." Some Christians celebrate the Feast of Mercy on the first Sunday after Easter. The mercy of Christ to and for us—and our demonstration of that mercy to those within and outside the Body of Christ is the key to the future of the Church, to mission and stewardship, to living our Christian lives together in love and forgiveness, to moving boldly and confidently into the future with courage in the Gospel. Matthew Harrison. Pentecost is seven weeks after Resurrection Sunday. Those seven weeks are celebrated as the Season of Easter in the Catholic Church. ↑ Christ Have Mercy: How to Put Your Faith in Action. This page was last modified on 17 December 2018, at 16:35. This page has been accessed 26,824 times.